We were recently featured on ABC7News for our first 2-week camp program! We had students develop their own projects during the final week using the skills they learned. "...to help my community through code and help increase the number of underserved students interested in hardware computing through She STEMs." Our founder, Ashley, was recently able to travel to Europe as an EF Global Citizen where she introduced award-winning animator, Glen Keane, and briefly spoke about She STEMs on stage at EF's annual Global Summit to over 2,000 attendees! This year, the summit's theme was about the influence of technology on society. She was able to speak about She STEMs with peers and international students as well as speak with other speakers including Randi Zuckerberg, Andini Makosinski, and Jason Latimer. She was selected as one of 15 students from around the U.S., and you can apply to and learn about EF's Global Citizen Program at https://eftours.com/global-citizen/. 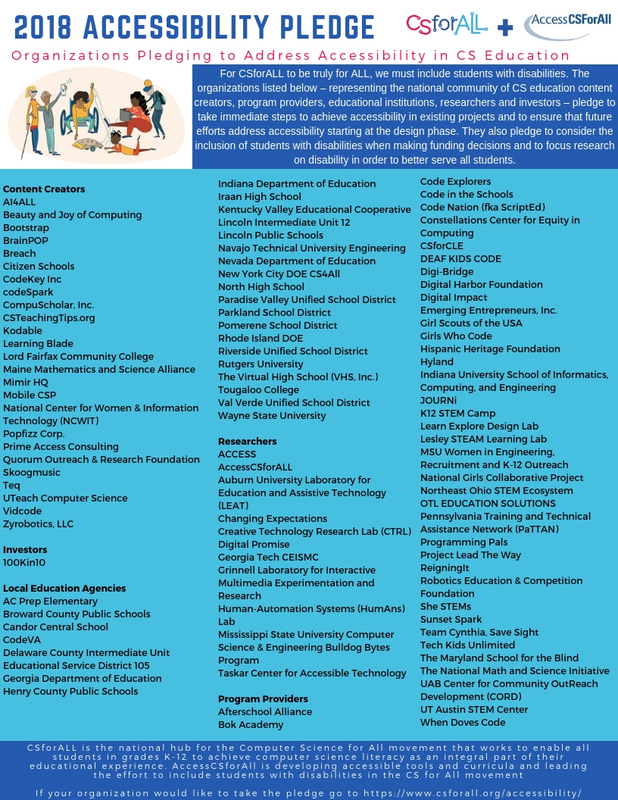 We signed CSForAll's accesbility pledge! By signing, we plan on making our platform and resources more accessible to people to students with disabilities. It's important to us that every student feels confident in who they are and what they can do. By making our platform more accesible, we'll spread our mission of empowering students to feel confident and capable in who they are through code. Expanding our team and partnerships! We're currently looking to expand our team and partnerships if you or your organization are interested in partnering with us to spread CS education. Contact us today!